Eulachnus agilis apterae are spindle-shaped and small. They are bright green with numerous dark spots and no wax (see first picture below). Their antennae are about 0.4-0.5 times as long as the body. 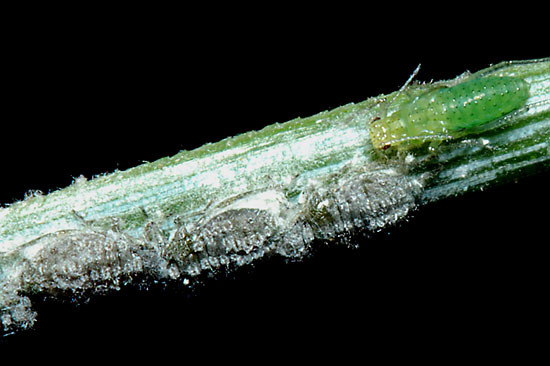 The third antennal segment is more than 0.25 mm long and bears hairs 20-130 μm long (cf. Eulachnus brevipilosus which has the third antennal segment less than 0.24 mm. long and bearing hairs less than 20 µm long.). The long antennal hairs of Eulachnus agilis are clearly visible in the second image below. The legs are rather pale with the hind legs often having mottled pigmentation. Hairs on the hind tibia are longer than the tibia diameter. The body length of the adult Eulachnus agilis aptera is 1.6-2.3 mm. 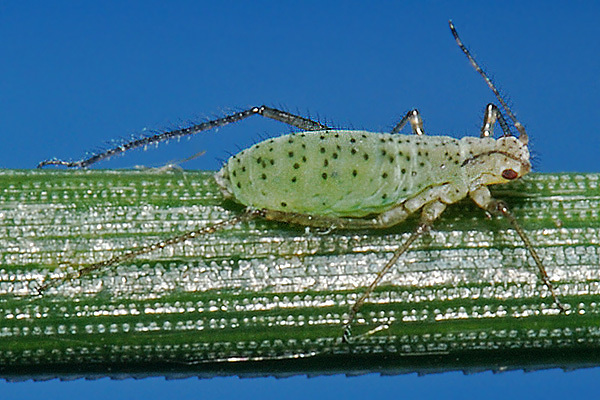 The spotted green pine needle aphid may be found feeding on old needles of many pines (Pinus species), but it is especially common on Scots Pine (Pinus sylvestris). It does not host alternate. Oviparae and alate males are produced in October-November, and the oviparae lay eggs singly on leaf scars on the branches. Eulachnus agilis occurs throughout Europe and parts of Asia, and has been introduced to North America. 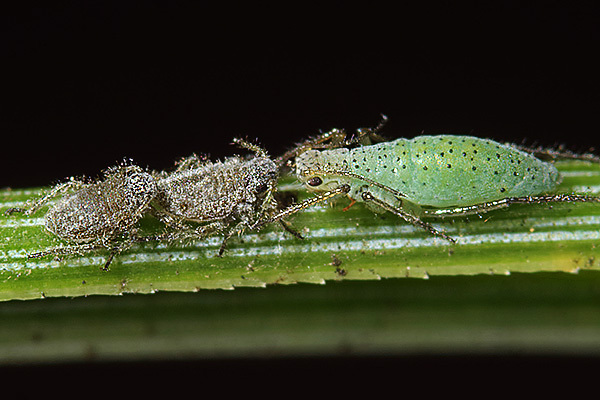 Eulachnus agilis associate in the field with a species of aphid that forms colonies, the wax-coated Schizolachnus pineti. When occurring alone, Eulachnus agilis favours old senescing needles, whilst Schizolachnus pineti avoids them. Despite this, Kidd et al. (1985) showed that both species show a significant tendency to share shoots and needles in the field. Kidd found the exact feeding site on the needle differed, with Schizolachnus pineti occuring only on the outer (curved) surface, and Eulachnus agilis prefering the inner surface. We, however, have found them together on the same surface on several occasions, as shown in the pictures above and below. By feeding on the same shoots and needles as Schizolachnus pineti, Eulachnus agilis benefits through increased survival and faster growth rates, possibly because the feeding activity of Schizolachnus pineti colonies improves the nutritive quality of needles. One of the most notable features about Eulachnus agilis (along with other Eulachnus species) is that they are very active. When disturbed they run away and find a hiding place. They do not form colonies on the pine needles, but are largely solitary, as with the aptera shown below. In Europe Eulachnus agilis is attacked by the specialist parasitoid Diaeretus leucopterus which has been suggested as a possible biological control agent. 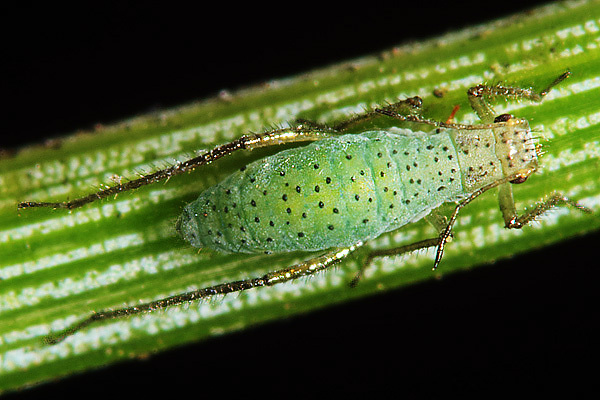 In a greenhouse trial, Murphy & Völkl (1996) showed that parasitism rates could be increased to 19%, but this was still insufficient to suppress the aphid population below a damaging level. 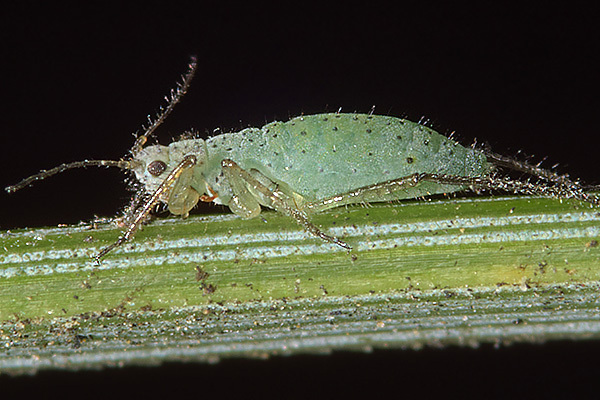 Moreover the number of aphid-infested needles on seedlings increased significantly owing to disturbance by the parasitoid's foraging activity. Eulachnus agilis has been recorded on 15 Pinus species - but prefers Pinus sylvestris. Blackman & Eastop list 30 species of aphid as feeding on Scots pine (Pinus sylvestris) worldwide, and provide formal identification keys for aphids on Pinus. Of the species on Scots pine Baker (2015) lists 15 as occurring in Britain: Cinara brauni, Cinara nuda, Cinara pilosa, Cinara pinea, Cinara pini, Cinara pinihabitans, Essigella californica, Eulachnus agilis, Eulachnus brevipilosus, Eulachnus rileyi, Pineus orientalis, Pineus pini, Pineus strobi, Prociphilus pini and Schizolachnus pineti. Heavy Eulachnus agilis infestations may cause economic damage to plantation trees. Bliss et al. (1973) showed that feeding by this species caused chlorosis and premature dropping of Scots Pine needles. Attempts have been made to control the species using systemic insecticides, but is seldom economically justified.